Via BLDGBLOG, I’ve just discovered Nicolas Moulin’s computer-altered images of Paris, with streets emptied of all life and the ground floors of each building sealed with concrete. You can see more of Moulin’s stunning work here. One commenter on the BLDGBLOG post referenced the opening scenes of Danny Boyle’s ‘28 Days Later’ – but these images are perhaps even more affecting, as all traces of human life has been removed. I spent last night watching Fernando Meirelles faithful adaptation of José Saramago’s novel ‘Blindness’, and was particularly impressed/horrified at the scenes depicting the city, Sao Paulo, after the population has become blind. The streets are strewn with rubbish, but also with families, animals and bodies. While much of this speaks of death, it also shows that the city is resolutely full of life, even after the blindness epidemic has affected everyone. I find Nicolas Moulin’s images compelling and disturbing precisely because of the lack of life, and because the comprehensive removal of all traces of humanity seems premeditated. The Day of the Triffids is often cited as the first and archetypal ‘cosy catastrophe’ novel. The hero, Bill Masen, is one of the few not to be blinded by the sights of a green comet storm as his eyes have been bandaged in hospital – in the first and most memorable scene he experiences a panicked blindness, then removes his bandages to find that the rest of the population is permanently blind. Only a day into the disaster, Masen discovers a society already collapsed, with many of the blind suicidal or frantically looting food from abandoned shops. John Wyndham performs a couple of sleights of hand in detailing the background to the disaster. The triffids, strange carnivorous plants with an unknown origin, have dispersed around the world several years before the catastrophe and are common enough to no longer concern Western society. The coincidence that the blinding of the population is enough to allow triffids to gain the upper hand is never explicitly linked to the arrival of the triffids themselves – instead, both the triffids and the green comet shower are usually vaguely linked to human experimentation within an impenetrable Soviet Union. Throughout most of the novel the Triffids present a persistent obstacle rather than a major threat. Wyndham uses the triffids to illustrate the tenuous hold on power that the human race had before the disaster – but the novel is more concerned with various groups’ opinions on the best way for society to survive. Masen meets several groups with differing opinions, from fatalist isolated communities to benevolent dictatorships. The despotic government offering Masen a feudal lordship over a blind community. Wyndham appears to stress the need for society’s moral code to reflect the circumstances, and he details Masen’s internal conflict about breaking taboos – for example, stealing from shops or sleeping with more than one woman. As per Jo Walton’s observations (see my first post, below), while many of the working class survive the initial blinding comet shower, they’re generally wiped out through their greed and inability to adapt. Bill Masen and the eventual stable communities are certainly middle-class and the outlook for their Isle of Wight appears ‘cosy’, while still likely to be fraught with the problems of sustaining a benevolent dictatorship. Peculiarly, Masen is the only character looking for a loved one (and even then, someone he’d met after the catastrophe, not before). Rereading the novel last month for a book group (the brilliantly garish Penguin copy on the right), I was surprised how little of the novel I’d remembered since reading it age 10 or 11. Other than the blindness disaster, the elements that had stuck were the free-roaming sections where Bill Masen steals one vehicle after another and loots shops for food. I hadn’t recalled the role of the triffids themselves, and even now they seem a McGuffin designed to exacerbate the problems facing the survivors. I’ll be interested to see how the BBC’s new TV adaptation (beginning broadcast on December 29th 2009) treats the triffids, as I’m sure it’s tempting to heighten their role at the expense of the general survival theme. I’ve been thinking about this film a lot recently. What’s striking about The Last Man on Earth (partly adapted by Richard Matheson from his novel I Am Legend) is the sheer tedium of Robert Morgan’s day-to-day existence in the years following the vampire virus outbreak. Vincent Price spends a great deal of the film detailing his routine tasks such as barricading the doors of his family home, collecting supplies of garlic from the supermarket and whittling stakes to clear the neighbourhood of vampires during the day. There are few glimpses of a post-disaster society – Morgan has spent several years alone, hounded by his vampiric former neighbours and stubbornly trying to live as traditional a life as possible in the circumstances. 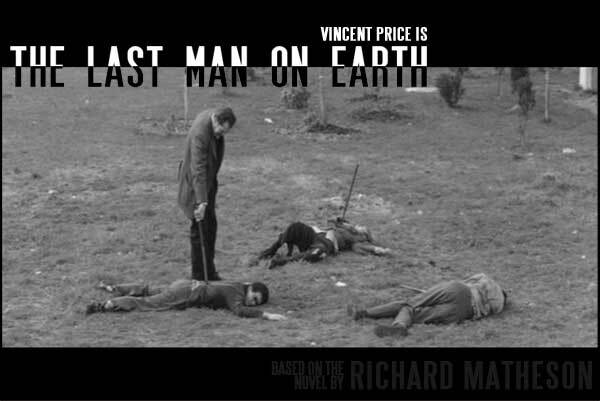 While the film was reportedly an influence on George A Romero’s 1969 Night of the Living Dead, I think The Last Man on Earth succeeds – and is unique – because it emphasizes the dullness of a post-apocalyptic world, rather than the threats or opportunities. The term ‘cosy catastrophe’ was coined by Brian Aldiss in his science fiction history Billion Year Spree. Cosy catastrophes are stories involving a sudden non-violent event wiping out most of civilization; the cosiness refers to the conceit of a band of survivors left to rebuild society in relative comfort. Aldiss originally used the phrase to describe (with a hint of criticism, perhaps) John’s Wyndham’s novels, particularly The Day of the Triffids. I think I’ve always been interested in cosy catastrophes, although I didn’t learn about Aldiss’ phrase until yesterday. I read The Day of the Triffids when I was 10 or 11, and while I found the catastrophe itself terrifying (the population watch blazing green comets in the sky, which by morning has rendered them all blind), I was caught by the idea of survivors having free reign over the country, with society in tatters. I’ve since read a bunch of dystopian and post-apocalyptic novels – but I think that the concept of the cosy catastrophe is the aspect that really chimes with me. But why? I’m starting to think it’s not too healthy an interest. Jo Walton points out that the survivors in the archetypal 1950s cosy catastrophe fiction are from the middle classes (with the working classes conveniently wiped out), and they rarely lose anyone significant to them. This allows the survivors to be nostalgic and yet able to recreate society from a more appealing starting-point. The final point is the one that often leads me to imagine a post-apocalypse world – i.e. what skills do I have that’ll help me to survive after an apocalypse? (Not many!) For the last few years I’ve been working on lengthy, often meandering editorial projects, so I can see the appeal of immediate and practical work. I guess there’s a self-indulgent excitement about the idea of wiping the slate clean in other senses too, particularly the idea of a less complex post-disaster society. So, I’ll accept the fact that my interest in cosy catastrophes is a kind of wish-fulfilment fantasy. I think I’m ok with that. I’m keen to think more carefully about fictional cosy catastrophes, partly to understand writer’s wish-fulfilments, but mainly to understand my own.